When I heard that cupcake connoisseurs Fancie were opening a new cafe along my daily commute, I was excited at the prospect of calorie-laden cupcakes and frothy coffees as an end-of-the-working-day treat (and, let’s face it, a pre-work pick-me-up.) However, Fancie’s new establishment at 359 Ecclesall Road isn’t just about the cake; Fancie have branched out into the brave new world of savouries and cooked breakfasts. The new cafe is a change from Fancie’s previous pink, cupcake-centric image; it’s a very rustic affair of exposed brickwork, pick-and-mix furniture and mismatched timber cladding. There’s Catherine’s Choice preserves behind the counter and delicious-smelling omelettes flying out of the open kitchen. Even the logo has been given a grown-up makeover. This is a new direction for the Fancie brand but fear not: there’s still plenty of their trademark cupcakes for those with a sweet tooth. This new incarnation seems to be going down a storm. When we visited on a Saturday morning we had to perform a lap around the venue before we found an empty table. The cafe appears to be a particular hit with young families, with a tangle of pushchairs leaning against the central pillar that dominates the cafe (and, annoyingly takes up a lot of potential seating space.) It’s bustling and noisy, but with a pleasant, family-friendly vibe. Factor in some quaint flower arrangements, vintage crockery doubling-up as sugar bowls and the olde-worlde, greaseproof paper menu, and you have a charming and quirky new cafe. There’s a limited lunchtime menu, but the food menu is focused on breakfast, with a selection of traditional cooked brekkies, omelettes, homemade granola and bread with jam or butter. The menu is currently missing a veggie cooked breakfast, but it does include a vegetarian sausage roll at a penny-pinching £2.10, so this isn’t a major problem. But, before the food, it was time for that old favourite: a brew. Fancie go the extra mile when it comes to the humble cuppa, particularly with their herbal infusions. The green tea arrived with an entourage of teapot, tea strainer, tea bowl, a quirky mismatched vintage saucer and a neat little egg timer that ensures your drink it always brewed to perfection. 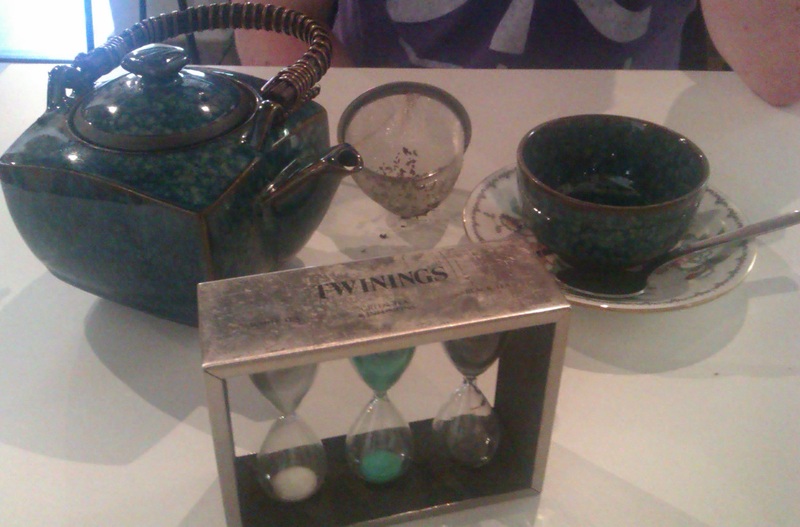 The egg timer is a lovely, thoughtful touch that makes a simple cup of tea feel extra special. However, at £2.80 for a one-person serving of green tea you do pay extra for the showmanship. After seeing the green tea I almost regretted ordering a plain old cup of Yorkshire tea, but for the bargain price of £1.10 I got a bucket-sized mug of the good stuff, served on a lovely vintage saucer with a generously-filled milk jug. 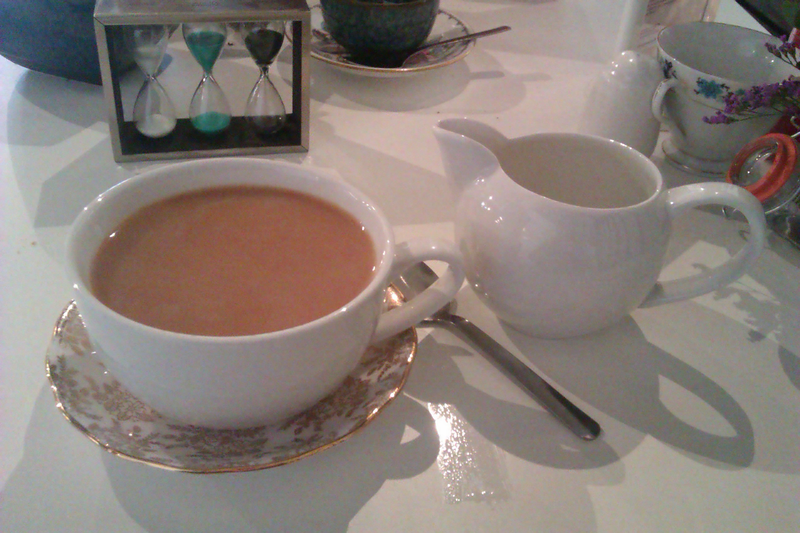 Fancie sure know how to make a good cuppa! The food arrived shortly afterwards, and again I was left feeling like I’d snagged a bargain. 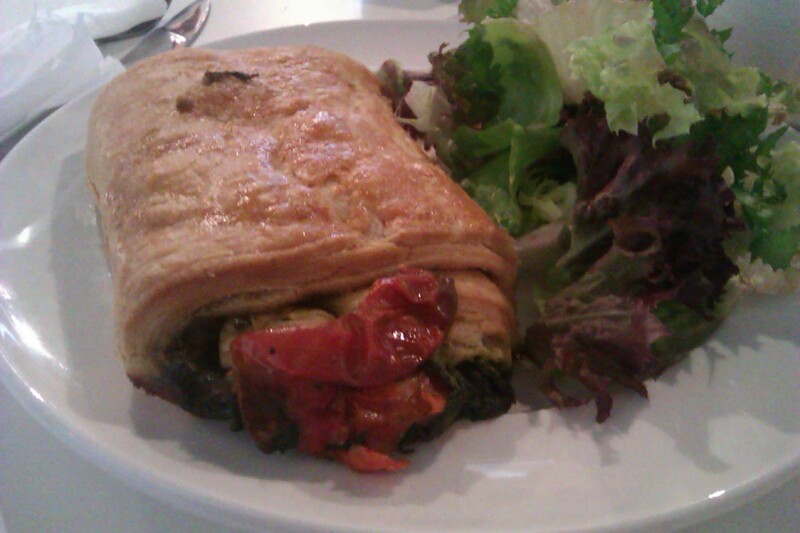 My veggie sausage roll was stuffed with tangy cheese, lashings of delicious spinach and flavour-packed tomatoes, all wrapped in thick pastry. I’m not a massive fan of pastry as a rule, but this was nothing like the thin, crispy, greasy stuff I’ve had before. At £2.10 this is a bargain that, thanks to the wedge of pastry, left me completely stuffed. 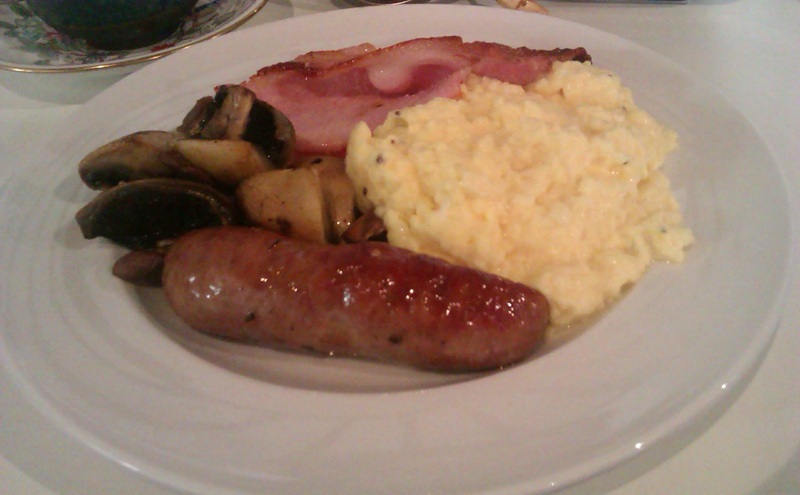 At the other end of the table, the Petit Breakfast’s (£4.50) motto was clearly ‘quality not quantity’ with two rashers of thick-cut bacon, a grease-free local sausage, buttery mushrooms and fluffy scrambled eggs laced with black pepper making for a tasty breakfast treat. A wedge of homely-looking brown bread and a generous pat of paper-wrapped butter bulked out the meal a bit, but at £4.50 the cooked portion of the breakfast did feel a little on the light side. The perfect spot for a truly indulgent cuppa, a light bite and, of course, the best cupcakes in the city. After developing a full-blown addiction to Tamper Coffee’s ‘Kiwi classic’ flat white, we caught up with owner Jon Perry, to find out the story behind Sheffield’s top coffee shop. Can you tell us a bit about yourself, pre-Tamper Coffee? Jon: I lived In Auckland New Zealand and worked within the coffee industry over there. My wife and mother are from Sheffield, so the UK was not unfamiliar to me. What led you to open a New Zealand-influenced coffee shop, in the heart of Sheffield? 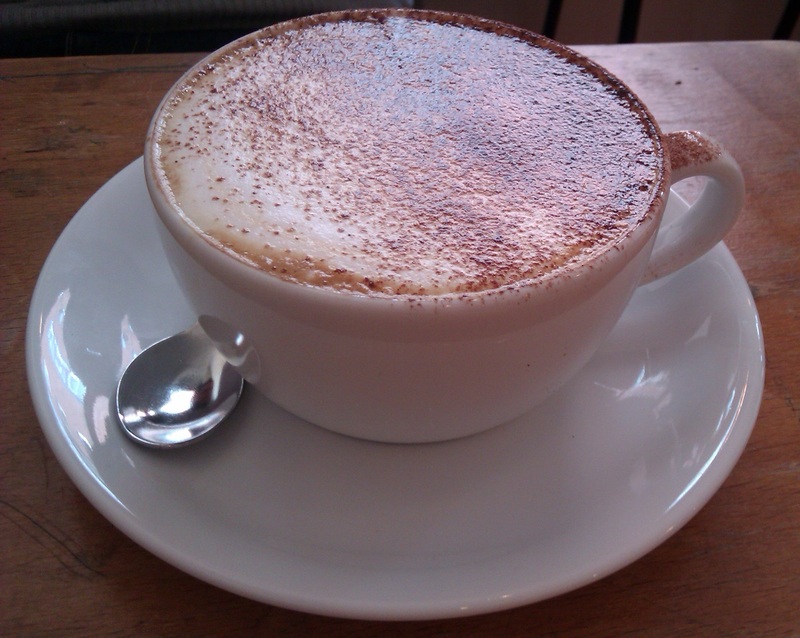 Jon: Setting up Tamper Coffee in Westfield terrace was very much unknown initially for us. Sheffield is hugely dominated by chains so to set up an independent coffee shop with a very New Zealand theme and influence was a risk, but we believed in our product and felt this type of offering was long overdue in Sheffield. There’s no shortage of coffee shops in city centers nowadays, and Sheffield is certainly no exception – what do you feel makes Tamper Coffee stand out from the crowd? Jon: I agree there are no shortage of chains in the inner city. Tamper is very customer focused, and we know our product well and are passionate about it. We try to create an environment where people feel comfortable and enjoy the experience. 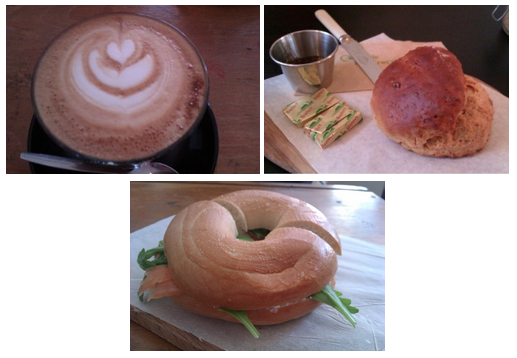 You opened Tamper Coffee in Winter last year – how have the past ten months been for you guys? What’s been the highlight? Jon: It’s been an enjoyable 10 months, hard work but hugely rewarding. We have enjoyed meeting with some amazing and talented individuals, but the biggest highlight is the people that come in and support us daily and weekly. How does the ‘coffee scene’ in Sheffield and the UK, compare to New Zealand’s attitude towards the coffee shop? 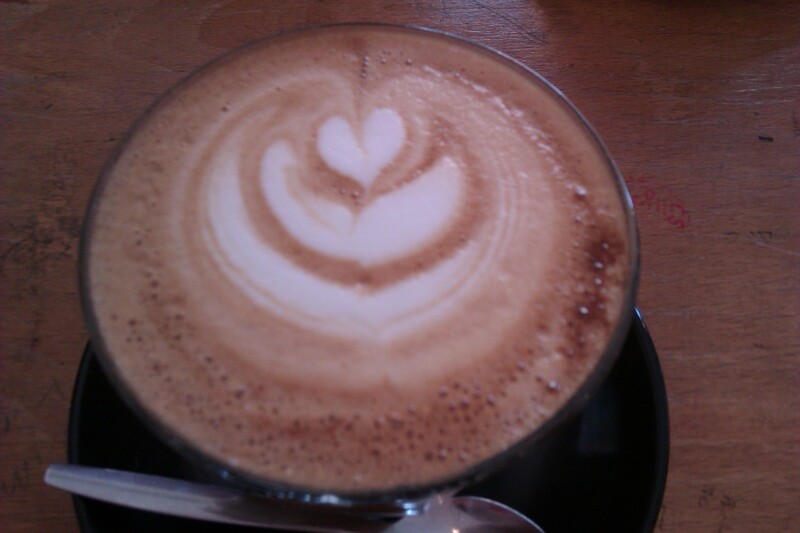 Jon: There is a real cafe culture in New Zealand and the standard of coffee is very high. Independents rule because they stand for quality and consistency. Coffee shops are a very social environment to meet family and friends. The UK produces some great coffee shops and some of the best coffee, but the majority still feel coffee should be served in a oversized cup and boiling hot. The more people experience good coffee through independents, the standard will change for the better. It’s encouraging to take stock of just how many independent coffee shops are in Sheffield city centre. If you’re off the booze (i.e hungover) but still have a hankering for something wet, you can plump for Starbucks or Costa Coffee, or you can take a gamble on one of Sheffield’s many independent coffee shops. I’ve walked past Manhattan Coffee House countless times, and there’s always someone sat outside with a newspaper and a cup of the hot stuff (I’ve actually seen some determined sod sat outside with an umbrella in one hand and a steaming hot cuppa in the other). So, this weekend we decided to see what these coffee fans knew, that we didn’t. Upon stepping inside, we were immediately impressed by the size of the place. The handful of metal tables squeezed onto the pavement suggests a rather pokey venue, but Manhattan is a roomy cafe that isn’t stingy when it comes to dishing out the space between its many comfy chairs and sofas. There is also a pleasant, laidback atmosphere that you rarely get in Eccy Road venues – this is the sort of place where people come to do crosswords and read their newspapers in peace. The staff are polite and efficient, and the prompt table service means there’s rarely more than one party at the till. Manhattan is also onto a winner with the decor, which includes beautiful displays of white flowers draped around the ceiling’s exposed pipes, and warm amber lighting. The hustle, bustle and noise of Ecclesall Road feels a million miles away inside this chilled establishment. So, top marks for the setting, but what about the coffee? The menu is extensive with a few twists to boot: cafeterias-for-one; a scrummy-sounding “hot chocolate sundae,” and plenty of icy, summertime favourites like frappucinos. 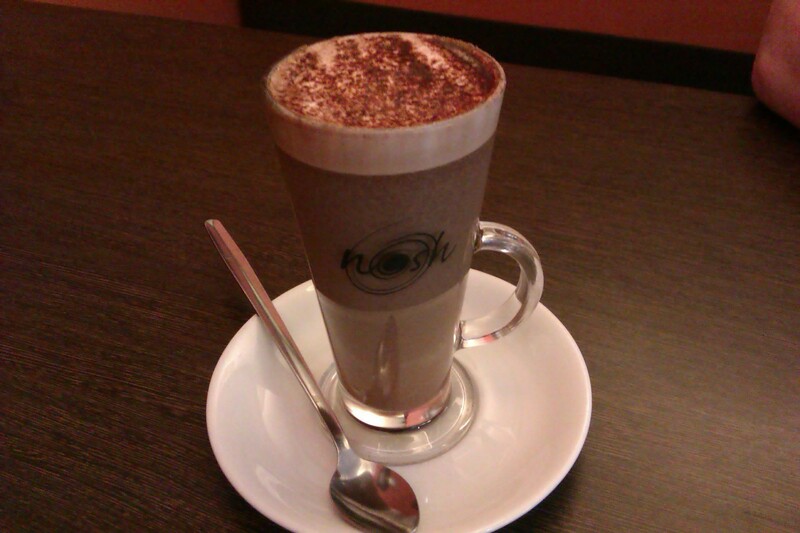 I opted for an old favourite, a regular mocha (£2.60) which came with a rich layer of foamed milk and lashings of cocoa powder. 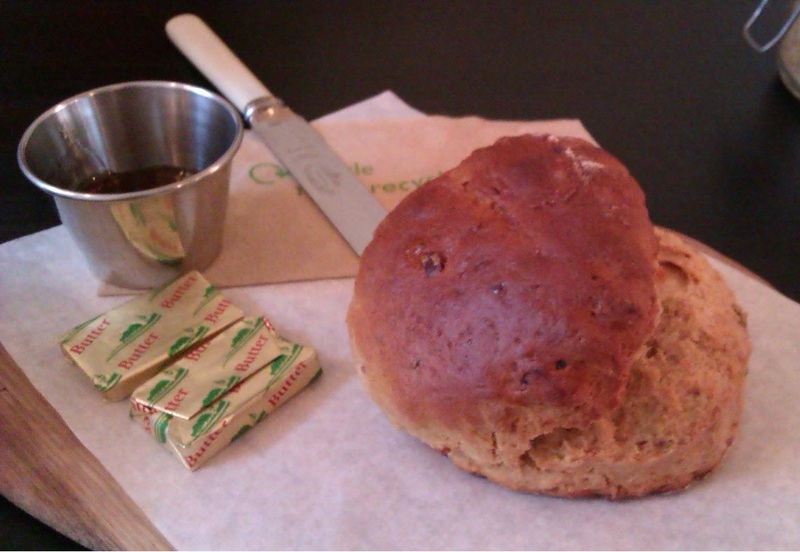 It was also served with an obligatory biscuit, a nice touch that’s often missing from the big coffee chains. Also arriving at our table was a cafeteria for one (£2.50) which isn’t a common feature on coffee shop menus (presumably because of all the washing-up it creates!) Manhattan’s cafeteria is available for several types of coffee, but our reviewer opted for columbian. Besides the novelty value of plunging your own cuppa, ground coffee trumps its filtered counterpart everytime, and it’s refreshing to have the option of a cafeteria even if the other members of your party aren’t big fresh coffee fans. Manhattan also gets top marks for serving the accompanying milk hot. It’s these thoughtful touches that make independent venues like Manhattan worth a punt, rather than playing it safe with household names. 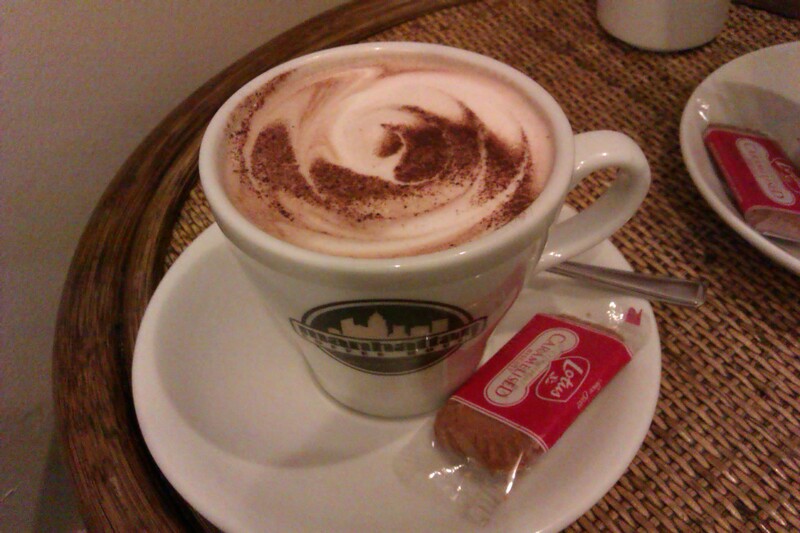 But Manhattan doesn’t just serve coffee, there’s a selection of indulgent hot chocolates too. 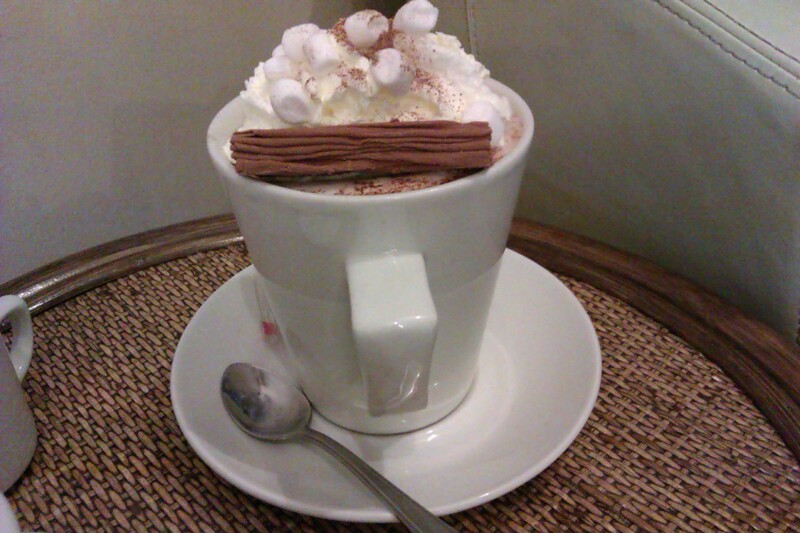 The Manhattan Luxury Hot Chocolate (£3.50) is piled high with cream, pink and white marshmallows and finished off with a Flake. This should be a sugar-addict’s dream in a mug, but the temperature of the hot chocolate spoiled this delicious-looking drink. Mashing the whipped cream into the hot chocolate (and let’s face it, who DOESN’T do that with a whipped cream topping?) made the drink unpleasantly cool. If you’re craving something sweet, you’re better off sticking to the Plain Hot Chocolate (£2.60) which is a no-frills mug of good old fashioned hot choccie. Ours even came with a pretty chocolate swirl etched into the milk; what more could you want? Manhattan is a pleasant and surprisingly swankily-decorated, coffee shop. While it could take a leaf out of Tamper Coffee’s book and serve Our Cow Molly’s super fresh milk, it still stands shoulder-to-shoulder with Starbucks and Costa in terms of taste – even if it gets pipped to the post by Tamper. A decent cuppa at a sensible price, in welcoming surroundings. 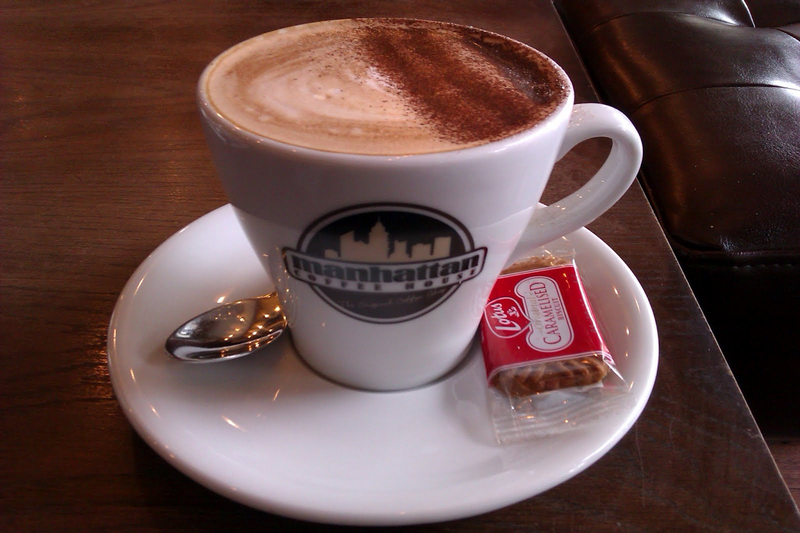 If it’s a choice between Manhattan and the Costa Coffee just around the corner, there really is no contest. As someone who enjoys whiling away Sunday morning in a coffee shop, it’s currently one of my biggest bugbears that Tamper Coffee doesn’t open on a Sunday (waaaaah!) The upside is that we’re always trying out new places for our little Sunday morning coffee club, which is how we discovered Nosh this week. Located as central-as-they-come on Division Street, Nosh is a bright, pleasant and cheap-as-chips purveyor of hot drinks and assorted snacks. We placed our order at the till, where we were served by a very pleasant waitress who, rather than rushing through our order, took the time to exchange a few pleasantries with us – a surefire way to make new customers feel positive about a place. We slipped into one of several surprisingly private booths and awaited our food and drinks. We were caught out by the fact that there wasn’t table service for hot drinks, and quickly returned to the counter for the liquid part of our order. There was also something a bit budget-hotel about the plastic tubs of sugar sachets and other condiments on the table, but these niggles were soon forgotten when we tucked into our hot drinks and snacks. 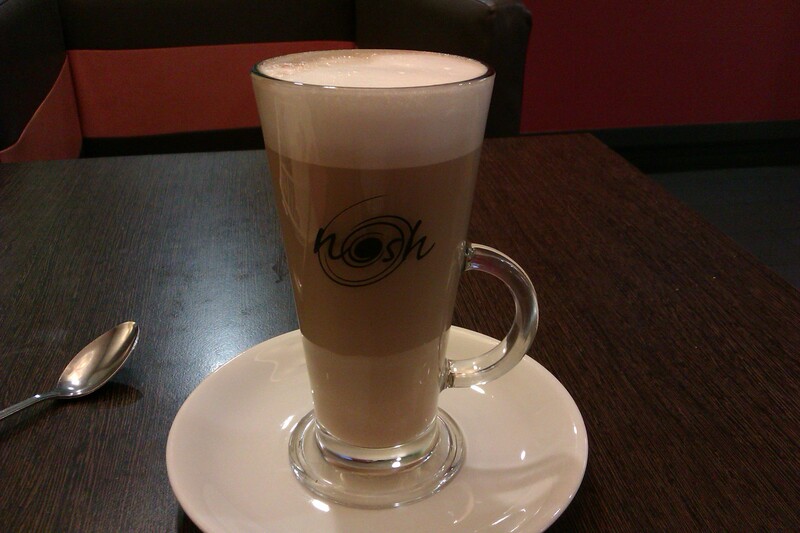 First up, was a bargain £1.95 latte which came nicely presented in a tall glass. Although the Our Cow Molly milk is sorely missing (Tamper, you’ve spoiled us!) this is still a cut above most big chains. My hot chocolate was rich and indulgent without being sickly, even the dregs at the bottom were delicious rather than silty with undissolved chocolate powder. The drink was finished off with (un)healthy lashings of yummy chocolate powder. At £2.19 this treat is an absolute steal. 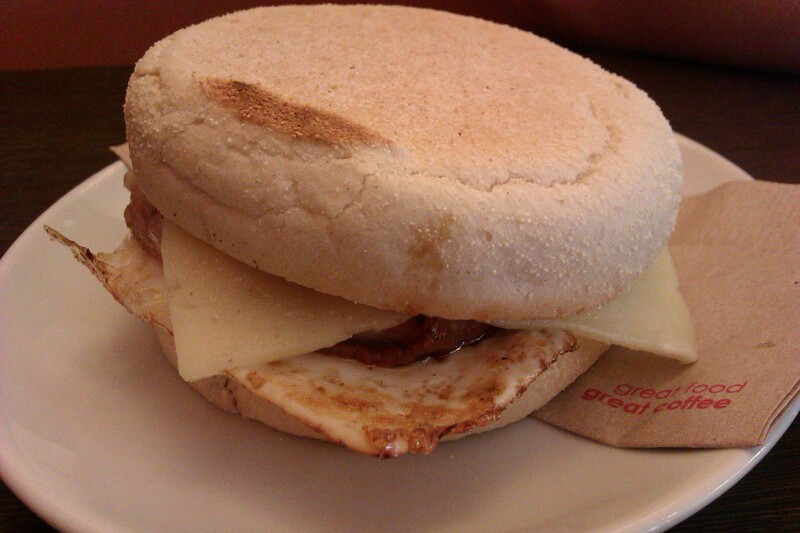 But that wasn’t the biggest bargain of the morning: the bacon, egg and cheese muffin we ordered came in at a pocket-friendly £1.60. A little dubious about this cheapie breakfast, we were pleasantly surprised by what showed up: a freshly-cooked, no-frills treat of tasty bacon, perfectly-cooked egg and a large slice of cheese. Grease-free and obviously pulled straight off the grill, our reviewer raved about the taste, the freshness and, of course, the price. A large americano (£2.10) to wash down the muffin equalled one very happy camper. Nosh is a cheap and cheerful place, set in bright, clean surroundings – they may pedal bargain butties, but there’s nothing ‘greasy spoon’ about them. 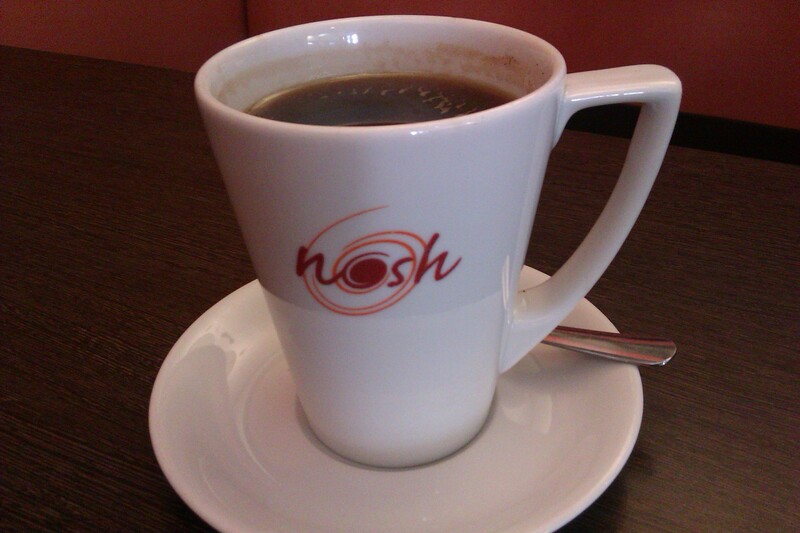 Nosh serve a decent, Fairtrade cuppa (at this point, it goes without saying you can get better coffee elsewhere in the city) but it’s the no-frills food where they really excel. Do yourself a favour, and treat yourself to a budget-friendly breakfast sarnie while you’re there. If you’re on a tight schedule and/or a tight budget, quick, pleasant and pocket-friendly Nosh is the way to go. Coffee and cake brunch? It can only mean one thing: a bank holiday! Located in the heart of Sheffield city centre (Barker’s Pool, to be precise) I’ve wandered past Patisserie Valerie a couple of times, and have always had my head turned by its calorie-ific window display of glazed fruit tarts; profiteroles topped with twists of chocolate and sculptured cream; and every variety of chocolate cake under the sun. Unable to fight it any longer, we were outside the shop waiting for it to open at 10am over the bank holiday weekend, like a right old bunch of cake-addicts. 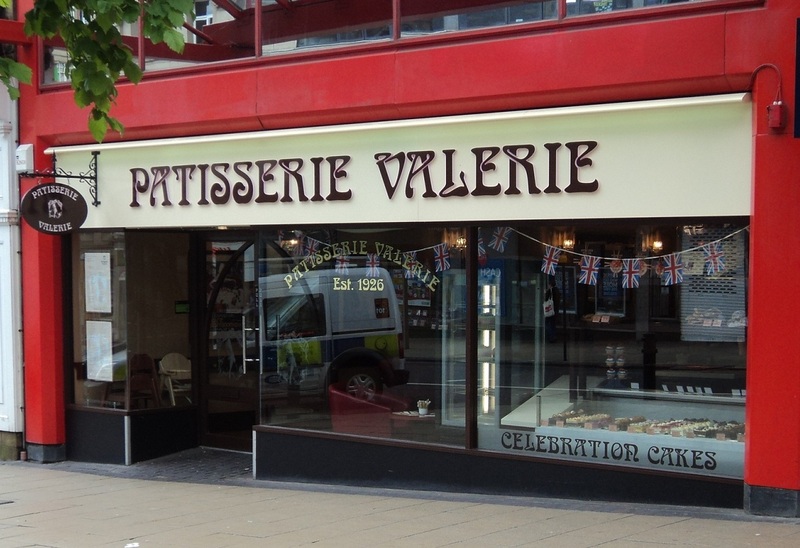 Despite being slap bang in the city centre, Patisserie Valerie boasts a small outdoor seating area. As the morning hadn’t properly warmed up yet, we settled on a table indoors. Beyond Patisserie Valerie’s work-of-art window display, the cafe has the same Parisian theme as Café Rouge. The seating is a trendy mix of dark wood and red leather, with plenty of Parisian artwork thrown in for good measure. It’s a very chic setting for your morning cuppa and despite being the first through the door, Patisserie Valerie soon filled up. This is clearly a popular cafe, particularly for families with young children. 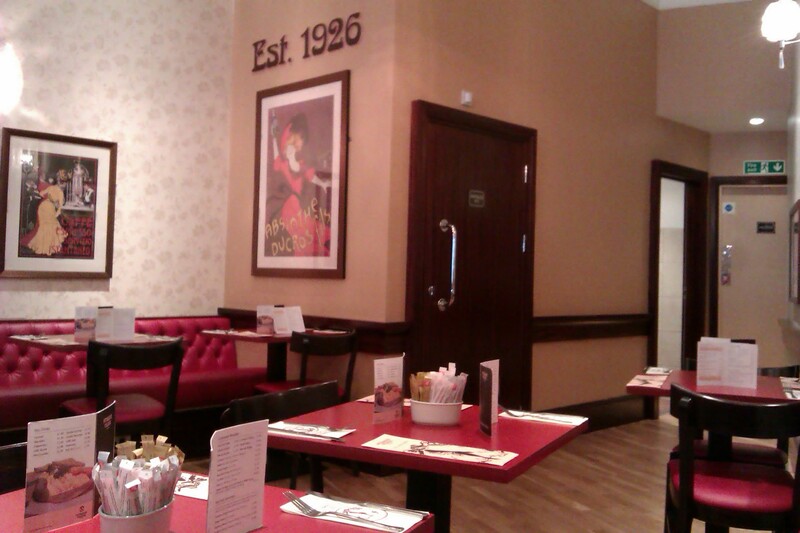 In addition to cakes and coffees, Patisserie Valerie serves a range of breakfast items, salads and sandwiches. Be warned though, the food is pricey – we spotted what was essentially a posh tuna club melt for £8.50, and a chicken caesar salad priced at £9.00. 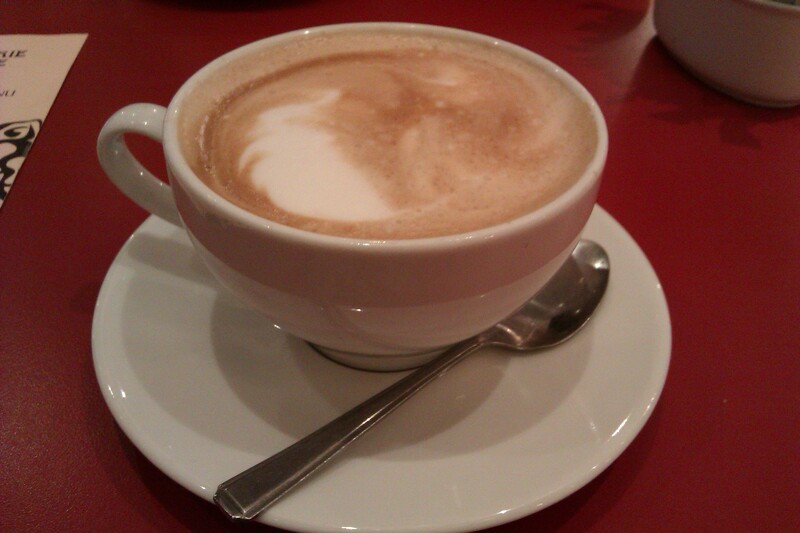 As it was still early, we decided to stick to coffee and cake, and ordered a selection of coffees: a latte (£2.80) cappuccino (£2.80) and americano (£2.70) which were all reasonably priced. The coffees arrived in the no-frills white mugs you can find in any coffee chain, which was a bit of a disappointment considering our swanky surroundings, but we were all happy with the size of our coffees. Patisserie Valerie serves a decent tasting cup of coffee, similar to a Starbucks or a Caffe Nero cuppa, just in a nicer location. But what we were really looking forward to was the cake. 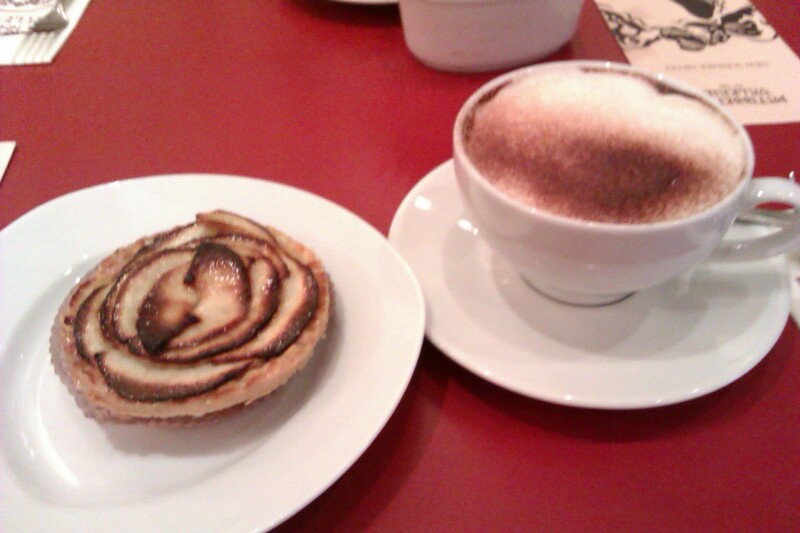 To offset our guilt, we ordered something that would provide us with one of our five a day (in addition to a wodge of calories and saturated fats) a round of Belgium Apple Tarts (£3.35). Heavily glazed and loaded with slices of apple arranged like flower petals, it certainly looked the part. More importantly, it tasted the part, too. The apple slices were sweet and had the tanginess of just-baked cooking apples, and the baker hadn’t skimped on the cinnamon. Spicy, juicy and sweet with a base of crumbly pastry, we were all in agreement that at just over £3, these posh apple tarts were well worth the money. 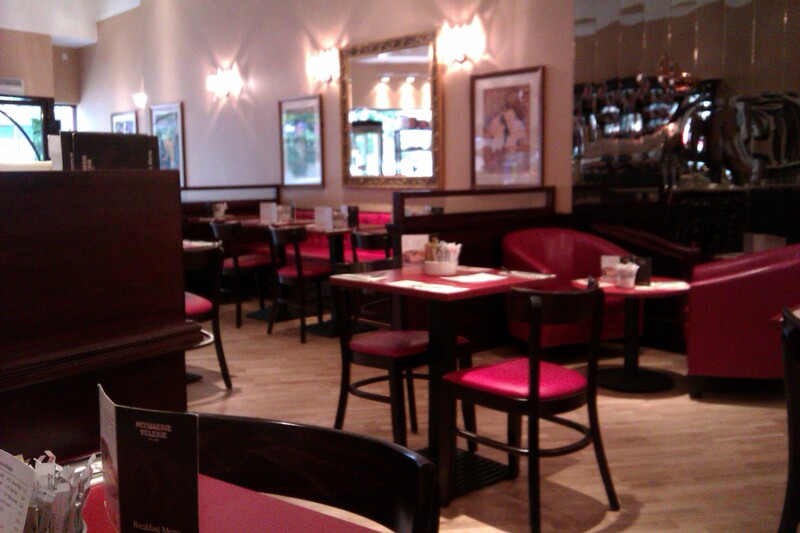 With a string of cafes all over the UK, Patisserie Valerie clearly work hard to maintain their ‘local cafe’ atmosphere. The boutique decor and lavish window displays create an independent vibe that makes this a far more pleasant venue than the coffee shops of other nationwide coffee chains. 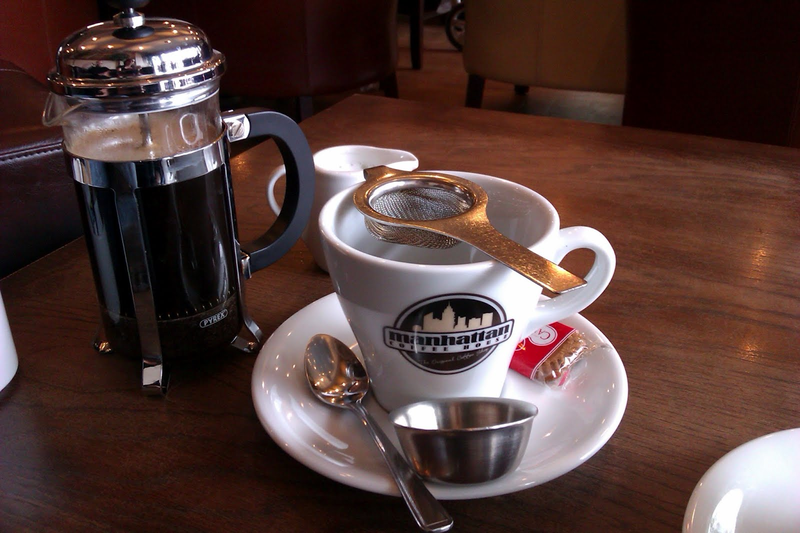 Although the coffee tastes similar to Starbucks and Caffe Nero’s, the decor, relaxed atmosphere and friendliness of the staff makes this a much more pleasant venue to while away a morning, and when it comes to cakes Patisserie Valerie excels – there isn’t a pre-packed muffin or cellophane-wrapped cookie in sight. A decent cup of coffee, a fantastic range of fresh cakes and characterful surroundings – Patisserie Valerie is a nationwide coffee chain done right.